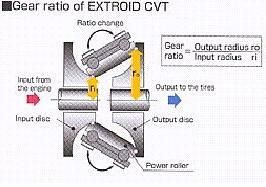 How does an Extroid CVT work? Instead of using a belt or chain as the media for varying transmission ratio this system utilises two pairs of rollers. As shown in the picture, the rollers link the input disc (connected to the crankshaft) and output disc (connected to the driveshaft). By varying the angle of the rollers, different transmission ratios can be obtained. For example, for low gearing ratio, the rollers meet the input disc near its inside diameter, but meet the output disc near its periphery. That means the output disc turns much more slowly than the input disc. The overall ratio range is 4.4:1. Compared with belt or chain CVT, the solid rollers can withstand much higher torque loads. Also because the input disc and the output disc are located in the same axis, it is able to be packed in a longitudinal gearbox, and is ideal for driving the rear wheels. It has taken NSK so long to develop the concept this far because they have had to develop a special way of producing pure metal, and also developing an oil that could cope with the extreme conditions within this CVT. In fact, this type of CVT is already used in the Nissan Cedric/Gloria and the Skyline 350GT-8.